When people use alcohol and marijuana at the same time, it’s often referred to as “cross fading.” But why do people do it? Some favour the mixture for its unique high, claiming they feel more intoxicated yet can consume less, while others spontaneously indulge while already under the influence of one or other other. Still more people advise against mixing the two, having experienced the nausea, dizziness, and other overwhelming feelings that can the pair can cause. But preference aside, what does science have to say? Much has been written about the effects of using alcohol and marijuana separately, but there is surprisingly little research on using them together. 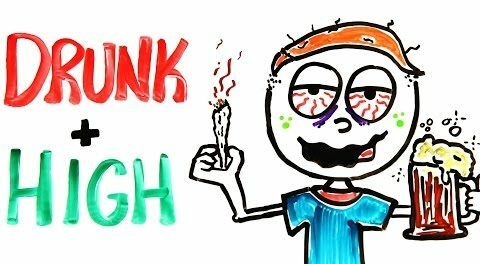 AsapSCIENCE recently released a video that dives deeper into the subject, exploring research that reveals there are some pretty strange things that occur biologically when you smoke and drink together. On its own, alcohol affects the central nervous system by altering the communication process of your neurons. This involves suppression of the excitatory neurotransmitter glutamate, and increasing the inhibitory neurotransmitter GABA. The end result for the user is less feeling, less recognition, and less recollection while you drink. Weed, however, involves the active ingredient THC, which alters the cannabinoid receptors in the brain, causing neurons to fire continuously. This results in your imagination and thoughts feeling intensely magnified and connected. The connection between the two is glutamate inhibition. Glutamate is an essential part of the learning process, with studies even linking getting high and drunk at the same time to bad memory. A 2002 study, for instance, revealed that rats were less capable of recognizing objects when they were drunk and high at the same time, as opposed to when they were just using one of the drugs. People who may not feel like marijuana has a significant effect on them may be happy to know that, for many, drinking also boosts the effects of weed. In fact, a study discovered that after drinking two shots of alcohol, participants’ THC blood plasma levels doubled in comparison to those who were stoned but only drank placebo alcohol. And tests on mice have shown that weed may actually reduce some of the damage that heavy alcohol consumption has on the liver as well. The video goes on to offer precautions for combining the two, including some dangerous side effects that are worth thinking about. For instance, though marijuana is often used as an effective anti-nausea treatment for those going through chemotherapy, with studies supporting its ability to serve this medicinal use, this prevention can actually pose a danger while drinking, since, if you consume too much and your body requires rejection of the poison through vomiting, the addition of marijuana might make this process difficult, if not impossible. No matter your decision to combine the two or not, remember that all bodies respond a little differently to drugs, and so it’s best to pay attention to whatever signals your body offers, and know that everything in moderation can really help keep you in check in situations like this.